An important point to remember when posting on WordPress is that everything is initially publicly visible. This means anyone in the world can navigate to the page and view your content. However, sometimes you may have a page/blog entry that you don’t want the rest of the world to see. If you’re writing something personal in a reflective blog, you might not want to share it with anyone but your instructor. There are two ways to do this in WordPress. You can choose from one of three options under Visibility on the right. To change these options click edit. 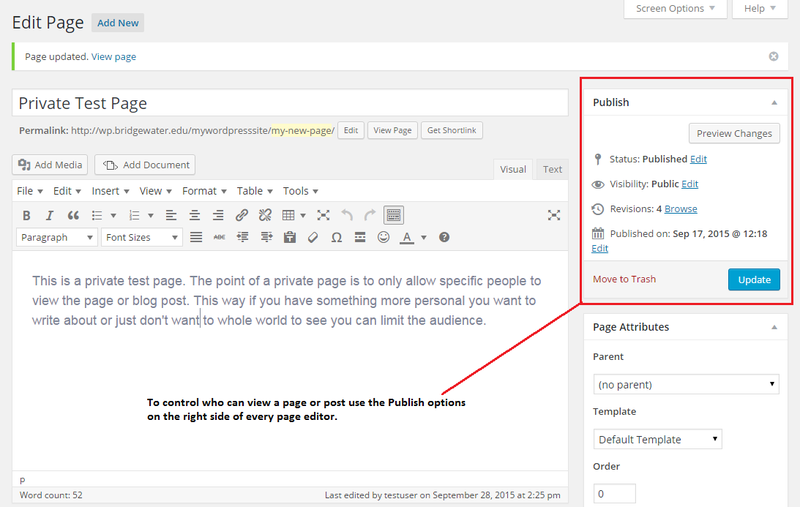 The default is public for all pages and blog posts. Once the user types in the password to the page, they are able to view the page’s content. Private pages are a little different. What this does is limit a page’s visibility to only those who are admin and/or editors on your WordPress site. If you set a page to private, no one else can even see the page exists! You may do this for a class or specific project, if your professor doesn’t want anyone to see your content besides the two of you. 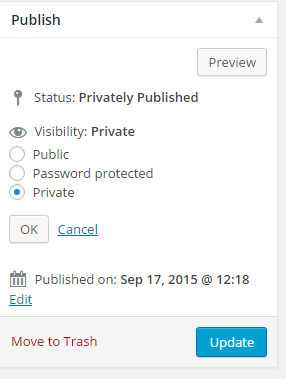 To allow your professor to view a private page, you have to add them to your site as an editor via the dashboard. Always select Editor, or they won’t be able to view your private content! To add a professor to your site, just enter their Bridgewater College email address in the email field, and click add existing user. They should receive a confirmation email saying you added them to your site.